In 2015 Honda officially and finally introduced the rebirth of the Africa Twin after more than a year of speculation my the motorcycle media, which included fuzzy photos of prototypes. The original Africa Twin, the XRV750, was produced between 1989 and 2003 and was sold mainly in Europe. It was designed after the motorcycle that won the Dakar Rally four times and was powered by a liquid cooled V-Twin engine. The XRV750 was not sold in the North American market, however a few were imported and are still sought after by collectors. For some reason Honda chose not to join the Adventure Touring "club" until now. The anticipation was that the new Africa Twin would retain the "nostalgia" of the original Africa Twin and be lighter and more "dirt" orientated than the other Adventure Touring bikes on the market. When the specs of the bike were released, there was initial disappointment as the weight tipped the scales at 515 lbs fully loaded with fuel and at 94 hp the Africa Twin is heavy and not close to the same power output as the BMW R1200GS, the industry leader in the Adventure category. On the positive side was the price. Honda chose to make a motorcycle with "basic" electronics along with more basic suspension components in favor of a price that's affordable to more people. One feature of the Africa Twin is the availability of Honda DTC, a 6 speed automatic that was introduced a few years ago in the VFR1200. Unfortunately this option adds an additional 25 lbs to the motorcycle. That's the information "on paper" and now for the review. My local Honda dealer, VI Honda, finally took delivery of a demo Africa Twin for a couple of weeks and sent an email to those who had expressed interest earlier in the year. The forecast for the day I had off was looking wet. Fortunately the dealer was perfectly happy to let me take the bike out in the rain. And it did rain! This particular Africa Twin was the flat black version and it had been outfitted with protection from SW-Motech. The tires were stock and had seen better days, which made riding in the rain "interesting". 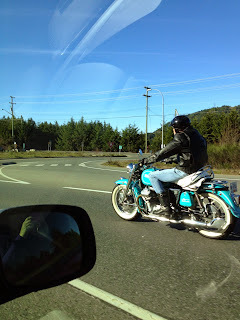 While I'm not a fan of the gigantic exhaust pipe, it did give a great "race" sound when fired up the motorcycle. The sound was even better once I started riding, especially on acceleration. The first thing I noticed when I got on the Africa Twin was that I could put both feed on the ground, or at least about 3/4's on the ground, with the seat in it's highest position. I'm 5'll" and have a short inseam so this is a good thing, especially in the off road environment. The third thing I noticed was home well the Africa Twin hid it's weight. It felt much lighter than it's listed weight and it felt even lighter once I got the bike going. As light as the bike feels, that will change if you tip it over. The fourth thing I noticed was how much the Africa Twin felt like dirt bike instead of a tall road bike. The narrow seat, tall bars and position of the foot begs were well thought out and will make riding off road fun. Unfortunately I didn't get to take the bike off road to confirm this. Besides the weight, the motorcycle critics questioned the power of Africa Twin, especially when compared to the other motorcycles in the Adventure market. I found this engine to be impressive overall. It's not going to win any drag races, however it has more than enough power to be comfortable on the highway and with 72 ft-lbs of torque it's fun to twist the throttle. The best part of the engine is how strong and smooth it is. I got into a position where I forgot to down shift before turning into a tight, steep corner in the heavy rain and the Africa Twin lugged smoothly from 1,500 RPM's in third gear. This will be another benefit in the off road setting. One feather I love on the Africa Twin is how easy it is to adjust the traction control, including turning it off. It's a press of a button and can be done on the fly. The ABS is also easy to turn off. Press a button near the instrument cluster and it's off. I found the highest level of traction control to be very intrusive and when it kicked in on the rain slick roads it felt like the bike had ran out of gas and the compression of the engine unsettled the motorcycle when this happened. At that point I turned the traction control off. Honda chose to spend time on the engine mapping and did a great job. The engineers felt that having multiple engine maps were unnecessary and in my opinion the Africa Twin doesn't need them. I's compare the Africa Twin to the BMW F800GS / GSA over the BMW R1200GS. The BMW comes with top of the line components, which you'll pay more for, and yet it feels bland and sluggish compared to the Africa Twin. The BMW is also lighter (only a little) and yet the Honda felt lighter to me. If I had to choose between the BMW F800GS / GSA or the Honda Africa Twin, I'd take the Africa Twin. The money I'd save would be used to "customize" the big Honda to my liking, with the foot pegs being the first change. The stock tires must go. The intrusive traction control at the highest setting. It's a big dirt bike. The electronics are easy to turn off. Thank you Honda Canada and VI Honda for letting me take the Africa Twin out for the afternoon. Great info. I love the looks of the African Twin, but I am too short for it. It is a tall motorcycle. Have you sat on the bike with the seat in the "low" positions? Basically this Honda bike is an ultra modern and eco friendly bike which provided you with a mileage of 27 kilo meter per liter.